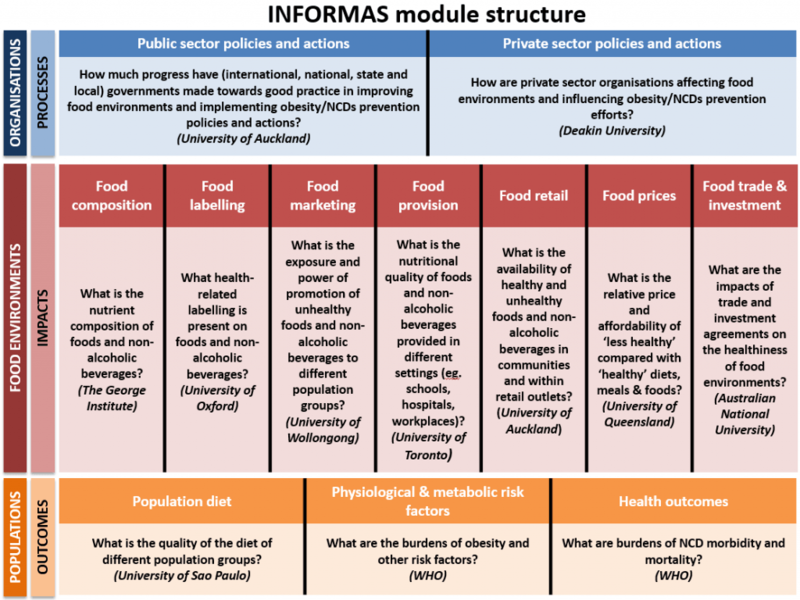 The INFORMAS framework includes two ‘process’ modules, that monitor the policies and actions of the public and private sectors, seven ‘impact’ modules that monitor the key characteristics of food environments and three ‘outcome’ modules that monitor dietary quality, risk factors and NCD morbidity and mortality. Monitoring frameworks and indicators have been developed for 10 modules to provide consistency, but allowing for stepwise approaches (‘minimal’, ‘expanded’, ‘optimal’) to data collection and analysis. INFORMAS data will enable benchmarking of food environments between countries, and monitoring of progress over time within countries. Through monitoring and benchmarking, INFORMAS will strengthen the accountability systems needed to help reduce the burden of obesity, NCDs and their related inequalities. Overview: How much progress have governments made towards good practice in improving food environments and implementing obesity/NCDs prevention policies and actions? Government action is essential to increase the healthiness of food environments and reduce obesity, diet-related non-communicable diseases (NCDs), and their related inequalities. A Government Healthy Food Environment Policy Index (Food-EPI) has been developed for INFORMAS, which comprises a ‘policy’ component with seven domains on specific aspects of food environments, and an ‘infrastructure support’ component with six domains to strengthen systems to prevent obesity and NCDs. How are private sector organisations affecting food environments and influencing obesity/NCDs prevention efforts? The first (‘minimal’) step is the collation of publicly available food and nutrition-related policies of selected private-sector organisations. The second (‘expanded’) step assesses the nutritional composition of each organisation’s products, their promotions to children, their labelling practices, and the accessibility, availability and affordability of their products. The third (‘optimal’) step includes data on other commercial activities that may influence food environments, such as political lobbying and corporate philanthropy. What is the nutrient composition of foods and non-alcoholic beverages? A food supply that delivers energy-dense products with high levels of salt, saturated fats and trans fats, in large portion sizes, is a major cause of non-communicable diseases (NCDs). The INFORMAS monitoring approach seeks to systematically collect information on high-level contextual factors influencing food composition and assess the energy density, salt, saturated fat, trans fats and portion sizes of highly processed foods for sale in retail outlets (with a focus on supermarkets and quick-service restaurants). Regular surveys of food composition are proposed across geographies and over time using a pragmatic, standardised methodology. What health-related labelling is present for foods and non-alcoholic beverages? Food labelling on food packaging has the potential to have both positive and negative effects on diets. Monitoring different aspects of food labelling would help to identify priority policy options to help people make healthier food choices. A taxonomy of the elements of health-related food labelling has been proposed for INFORMAS. 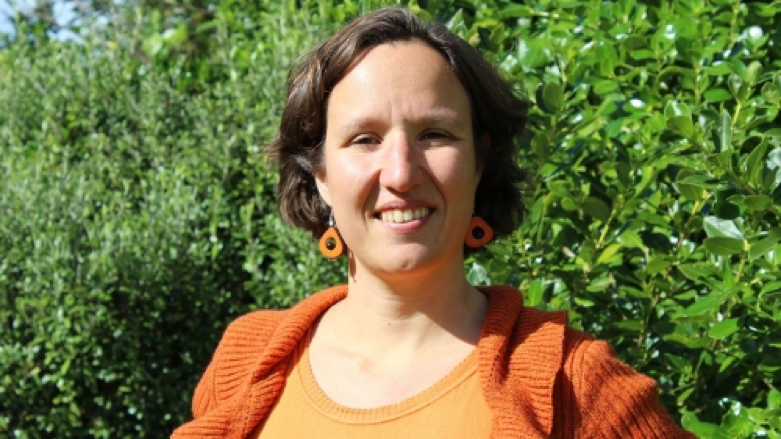 A step-wise approach has been developed for independently assessing the nature and extent of health-related food labelling in different countries and over time. Overview: What is the exposure and power of promotion of unhealthy foods and non-alcoholic beverages to different population groups? Food and non-alcoholic beverage marketing is recognised as an important factor influencing food choices related to non-communicable diseases. A step-wise approach, comprising ‘minimal’, ‘expanded’ and ‘optimal’ monitoring activities, has been designed for INFORMAS. This approach can be used to assess the frequency and level of exposure of population groups (especially children) to food promotions, the persuasive power of techniques used in promotional communications (power of promotions) and the nutritional composition of promoted food products. The proposed framework supports the development of a consistent system for monitoring food and non-alcoholic beverage promotions for comparison between countries and over time. Overview: What is the nutritional quality of foods and non-alcoholic beverages provided in different settings (e.g. schools, hospitals, workplaces)? The focus is on foods in schools, but the framework can also be applied to foods provided or sold in other publicly funded institutions. In component I, information on existing food or nutrition policies and/or programmes within settings would be compiled. In component II, the quality of foods provided or sold in public sector settings is evaluated relative to existing national or sub-national nutrition standards or voluntary guidelines. Overview: What is the availability of healthy and unhealthy foods and non-alcoholic beverages in communities and within retail outlets? Retail food environments are increasingly considered influential in determining dietary behaviours and health outcomes. And determine the impact of changes to retail food environments on health outcomes, such as obesity. Overview: What is the relative price and affordability of ‘less healthy’ vs ‘healthy’ foods, meals and diets? The University of Queensland, Herston, Queensland, Australia. What are the impacts of trade and investment agreements on the healthiness of food environments? The liberalisation of international trade and foreign direct investment through multilateral, regional and bilateral agreements has had profound implications for the structure and nature of food systems, and therefore, for the availability, nutritional quality, accessibility, price and promotion of foods in different locations. The proposed INFORMAS monitoring approach encompasses a set of guiding principles, recommended procedures for data collection and analysis, and quantifiable ‘minimal’, ‘expanded’ and ‘optimal’ measurement indicators to be tailored to national priorities, capacity and resources. Overview: What is the quality of the diet of different populations? In order to assess the impact of food environments on population diets, it is necessary to monitor population diet quality between countries and over time. In the proposed ‘minimal’ approach, national trends of food and energy availability can be explored using FBaS. In the ‘expanded’ and ‘optimal’ approaches, the dietary share of ultra-processed products is measured as an indicator of energy-dense, nutrient-poor diets using HBES and food intake surveys, respectively. The communication element of the INFORMAS project sets out to bring the results to the attention of the relevant stakeholders concerned with the quality of food environments, including governments and their agencies, intergovernmental bodies, commercial and trade organisations, health professionals and public health and consumer advocacy organisations. It is intended that all the base results will be reported and made freely available, subject to confidentiality, copyright and data protection constraints. In this way, it is hoped that INFORMAS outputs can be made an open resource for broad dissemination and widespread use. A list of INFORMAS module leaders can be viewed here.